Fodder scam: Lalu Prasad Yadav, 44 others convicted; sentencing set for October 3. A CBI designated court delivered its verdict in a fodder scam case involving Rashtriya Janata Dal (RJD) chief Lalu Prasad Yadav. The court found Lalu guilty. 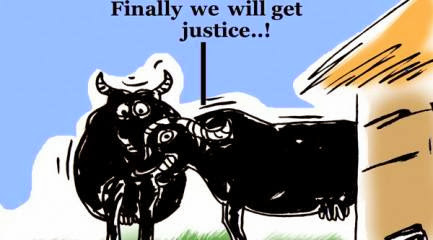 Besides the RJD chief 44 other persons were also found guilty in one of the five fodder scam cases. A lawyer announced that the quantum of punishment will be announced on October 3 and is set to be more than 4 years. As Yadav's lawyer completed arguments in the case on September 17, special CBI Judge PK Singh will pronounce the judgment in the case No RC 20 A/96 today. Yadav moved the Jharkhand High Court and later the Supreme Court, seeking change of the judge in the case. Both the courts dismissed his petition, and directed him to complete argument in the case before the CBI court. Yadav had in his petition alleged that trial court judge PK Singh was biased against him as he is a relative of PK Shahi, Education Minister in the Nitish Kumar Government in Bihar, "who is his (Yadav''s) biggest political enemy". Authorities in Bihar sounded an alert across the state, apprehending trouble after the court pronounced verdict in a multi-crore fodder scam case involving Rashtriya Janata Dal chief Lalu Prasad Yadav. The case pertains to alleged fraudulent withdrawal of Rs 37.7 crore from Chaibasa Treasury in the 1990s. The FIR was lodged by Bihar government in February 1996 but the case was transferred to CBI a month later. CBI had investigated the scam for a year and the charge sheet was filed in 1997. The charges were framed in 2000 following which the Special CBI court commenced trial against Lalu Yadav and 44 other accused. RJD's plea had faced stiff opposition from JD-U leader Rajiv Ranjan who submitted that it would be a ‘travesty of justice’ if the judge is transferred at the far end of the trial. He submitted that it would give a wrong impression to the entire country if the judge is transferred and raised a question on RJD supremo's petition seeking transfer of the judge who has been hearing the case since 2011. The fodder scam also known as "Chara Ghotala" involved the siphoning of funds from the Bihar Government treasury. The alleged theft spanned over several years, and many Bihar state government administrative and elected officials across multiple administrations were allegedly engaged in it. Additionally, there are also allegations that they were involved in the fabrication of "vast herds of fictitious livestock" for which fodder, medicines and animal husbandry equipment was supposedly procured. The fodder scam was unearthed in Bihar in 1996 when Lalu Prasad was the Chief Minister of the state. He had resigned from the post in 1997 after a court issued an arrest warrant against him in connection with one of the cases. Besides the RJD supremo, other accused persons include former Bihar Chief Minister Mishra and JD(U) MP Jagdish Sharma. The judgement in the fodder scam is likely to have a bearing on Bihar politics, as the RJD chief will face immediate disqualification as a Lok Sabha member if convicted as per a Supreme Court order that an MP or legislator would stand disqualified immediately if convicted by a court for crimes with punishment of two years or more. The government later promulgated an ordinance to undo the apex court order, prompting opposition BJP to allege that it had been done to protect Lau Prasad Yadav in case he is indicted in the fodder scam. Congress Vice-President Rahul Gandhi has, however, slammed the ordinance as "complete nonsense" which should be "torn up and thrown away," leaving its fate uncertain.